The latest scuttlebutt on the Walgreens-Rite Aid merger: Walgreens Boots Alliance looks to be divesting even more stores and other assets to Fred’s. Citing anonymous sources, Bloomberg reported Tuesday that WBA is “nearing an agreement” to raise the number of stores to sell to Fred’s as well as include distribution centers, software and staff. No store numbers were mentioned. The deal also would extend the 24-month period in which Fred’s would get rights to the Rite Aid brand, the report said. Bloomberg’s report, too, pointed out that the WBA-Rite Aid deal is being scrutinized by the Federal Trade Commission with less than its full complement of commissioners, with only two of five spots filled and no permanent chairman amid the transition to the Trump administration. “The merger, which would combine the No. 2 and No. 3 [U.S. drug chains] in the industry, has also raised concerns among state attorneys general, at least a dozen of whom are scrutinizing the deal,” Bloomberg reported, citing an unidentified person familiar with the matter. Last week, the New York Post reported that WBA may claim that it has “certified compliance” in its application, meaning that it has provided the FTC with the information needed to determine if the Walgreens-Rite Aid merger is antitrust-compliant. If that’s indeed the case, then the FTC would have 30 days to finish its review of the merger deal. Fred’s on Dec. 19 announced a $950 million cash deal to purchase 865 Rite Aid stores to be divested for antitrust clearance of WBA’s planned acquisition of Rite Aid. The agreement with the discount retailer is subject to FTC approval as well as WBA’s completion of the Rite Aid transaction. Also under the agreement, Fred’s could be required to buy additional stores if the FTC calls for WBA to divest more stores than was contemplated when the deal with Fred’s was struck in December. On Jan. 30, WBA and Rite Aid extended the end date for the acquisition deal, lowered the purchase price and raised the number of stores that could be divested from up to 1,000 to as much as 1,200. And then early last month, Fred’s said it amended a revolving credit facility in the event that it must acquire additional Rite Aid stores in connection with the pending Walgreens-Rite Aid merger. The addition of the Rite Aid stores would make Fred’s the third-largest U.S. drug chain, with 1,219 pharmacies in 1,508 stores. 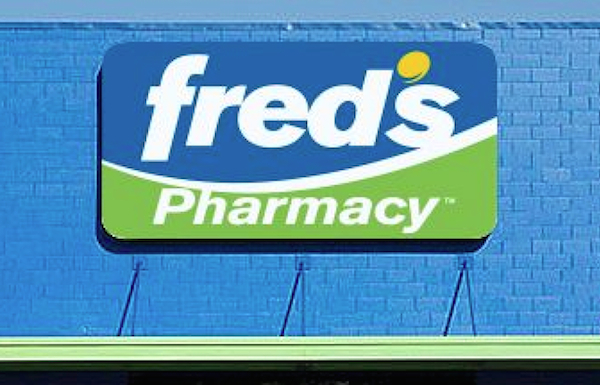 Fred’s currently has 643 discount general merchandise stores and three specialty pharmacy-only locations in 15 Southeastern states. The stores include 354 full-service pharmacies.